Cancer has proven to be a wily foe, in part because the cells are so effective at hypnotizing the immune system that should act to destroy them. In recent years, cancer therapies that activate the body's own immune system to destroy tumors have improved the odds against some cancers, including formerly incurable skin cancers like that afflicting former President Jimmy Carter. But the immunotherapies currently available only activate one arm of the multi-pronged immune system — the adaptive immune system – and aren’t always effective. 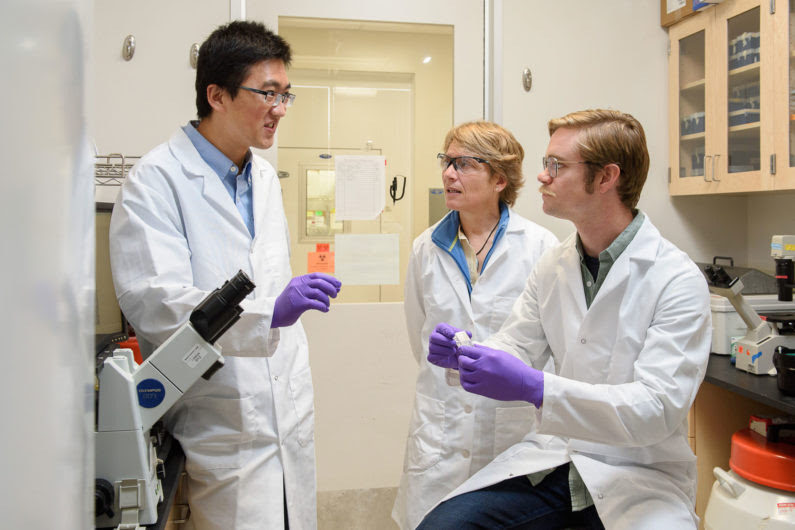 Carolyn Bertozzi, a Stanford professor of chemistry, has now shown that removing certain sugars surrounding breast cancer cells can recruit a second arm of the immune system — the innate immune system. The approach, described in a study published Aug. 22 in Proceedings of the National Academy of Sciences, greatly improved the effectiveness of a breast cancer drug in a lab dish, opening up a new avenue in the fight against cancer. "This is a whole new dimension to immune therapy," Bertozzi said, adding that she thinks it could be the first of many therapeutic approaches involving the sugars that surround cells, called the glycocalyx. "People in this field are starting to appreciate that there are many different nodes that you need to affect to get a more robust immune reaction against a tumor, and the glycocalyx appears to be one of those nodes," she said. Scientists have long known that if certain sugars are present on a tumor, it is less likely to respond well to therapies. But nobody knew what that halo of sugars was doing, in part because such a small number of labs study the glycocalyx. Evidence had been mounting within those few labs that do study the glycocalyx, including Bertozzi's, that a subset of sugars called sialic acids act as a signal for the innate immune system to ignore the otherwise suspicious-looking tumor. Eliminate those sugars, and maybe innate immune cells would be more likely to recognize and attack the cancer cells, Bertozzi thought. And essentially that's exactly what happened. Bertozzi and her team worked with breast cancer cells in the lab that had varying amounts of a protein called HER2 on the surface. This is a well-known protein that's present at some level on about three-quarters of breast cancers. Women whose tumors have that protein at high levels generally receive a therapy called Herceptin, which is an antibody that binds to HER2 and flags the tumor cell for destruction by innate immune cells, such as natural killer (NK) cells and macrophages. But Herceptin doesn't always work, especially in tumors with less abundant HER2, and if sialic acids are present on the cancer cell surface, then it’s even less likely to be effective. Bertozzi and her team used chemistry tools they'd created in previous work to attach what is essentially a chemical lawn mower onto the Herceptin antibody. Once the drug bound to HER2 molecules on the cancer cell, the chemical mower sliced off the neighboring sialic acids. With those sugars gone, Herceptin became significantly more likely to activate NK cells to kill the cancerous cells, especially in cases where the cells had lower levels of HER2 and higher levels of sugars. This all took place in a lab dish, but Bertozzi is hopeful a version of this strategy could be effective in people. Bertozzi said that cancer immunotherapies are a matter of tilting the scale of signals present on tumors, some of which tell immune cells to attack, and others of which tell immune cells to turn a blind eye. "All of the world of immune therapy is now thinking about the immune system as calculating pluses and minuses. If you want to tilt the scale toward immune activation, you can either augment the activator or remove inhibitor, or both," said Bertozzi, who is also an investigator with the Howard Hughes Medical Institute. Current immunotherapies on the market work by blocking one of the inhibitory signals that are recognized by the adaptive immune system. Block those and the balance tilts in such a way that the immune system will attack the now recognizable cancer. Bertozzi's approach provides a second way of tiling the balance in favor of attack, this time for the innate immune system. She said this study shows just one example of how it could work, but her sugar-removing lawnmower could be used on a wide variety of cell types, not just those expressing HER2, and on different types of sugars. "It's almost always the case that you need a component of both the adaptive and innate immunity to get a robust reaction against infectious pathogens, such as during vaccination," said Bertozzi. "The smart money suggests that the same will be true with tumors." Bertozzi said the approach also highlights the importance of paying attention to the much ignored glycocalyx. "The fact that people don't study and understand the contribution of the glycocalyx to interactions means there’s lost opportunity there," Bertozzi said. "I think this work might turn the tide on that situation." The study is titled "Precision glycocalyx editing as a strategy for cancer immunotherapy." The work was funded by the National Institutes of Health. Bertozzi is the Anne T. and Robert M. Bass Professor in the School of Humanities and Sciences and a professor, by courtesy, of radiology and of chemical and systems biology. She is a member of Stanford ChEM-H and Stanford Bio-X. Are the Courts Finally Ready to Deem the Religious or Racial Exclusion of Immigrants Unconstitutional?